We are interested in the influence of light scattering of bacteria in the arsenic detection. 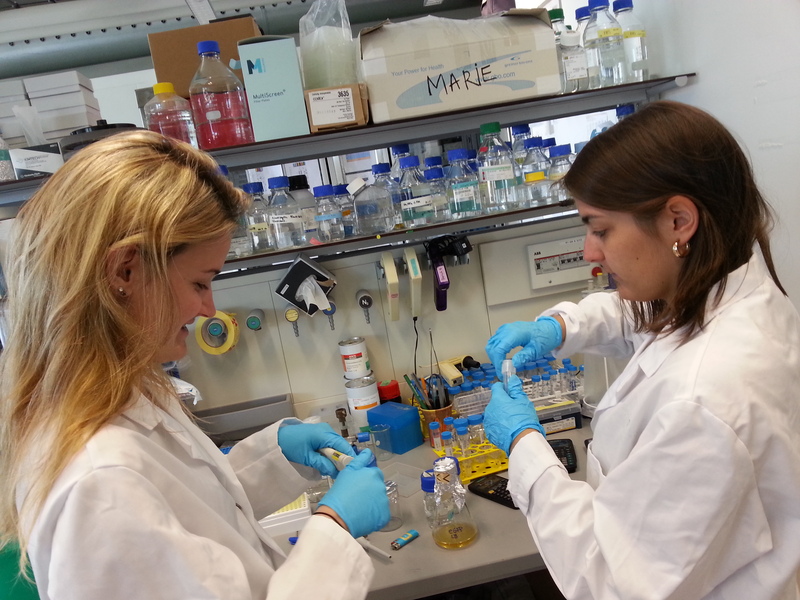 In order to test that we had to purify the GFP from bacterias. We chose the Three-Phase Partitioning method  because that seemed to be an easy and interesting method to separate GFP from bacterias. We started the protocol in good conditions but at the step where we should have seen if the concentration of the starting buffer was good, the drops surprisingly seemed to go up in each concentration. We tested a lot of different concentrations, but we obtained each time the same results: the drop desperately went up. We didn’t discouraged and decided to continue with 3 different concentrations (1.6M, 3M and 4M of starting buffer). Finally, the results gave that the GFP was not visible to the naked eye but with fluorescence analysis the GFP was existing in the 3 samples. We were very happy of these results and concluded to perform again the experiment with more bacterias and with the 1.6 M starting buffer. 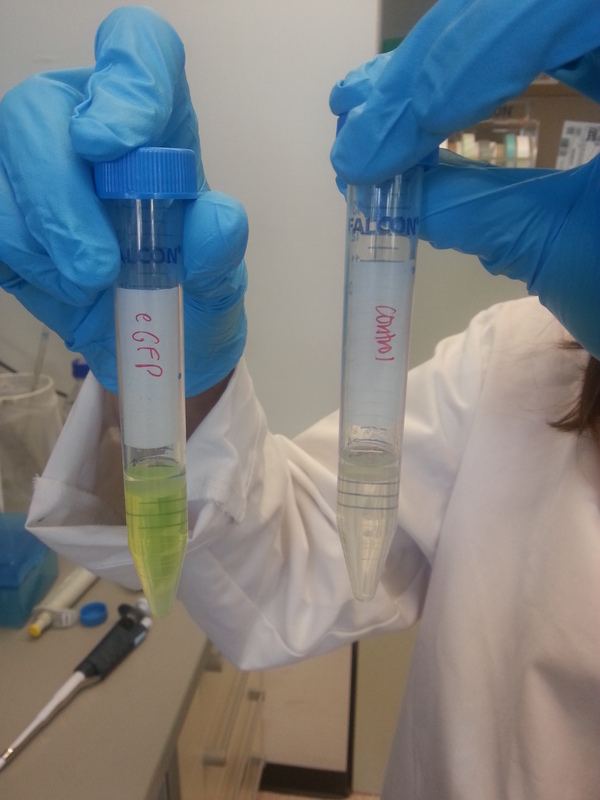 Observe 3 phases: butanol, membrane and constituent cells, GFP phase for eGFP bacteria and without GFP for control. We measured the fluorescence of 1.6M starting buffer to compare the green fluorescence between bacteria with GFP, bacteria and sample without bacteria. The fluorescence of control bacteria of 873 can be explained because lots of things fluoresce in green in biology. The difference between eGFP and control bacteria fluorescence is significant. 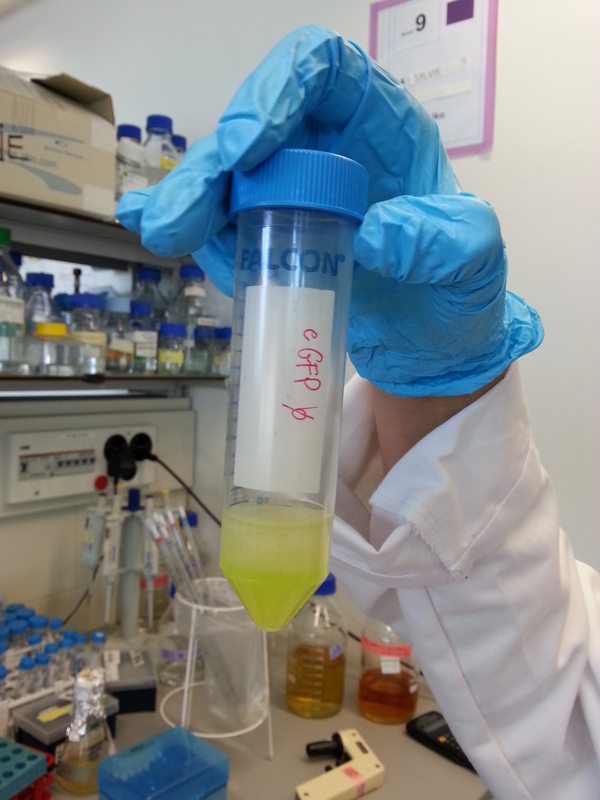 We obtained about 4ml of free GFP (from lysis of eGFP bacteria).